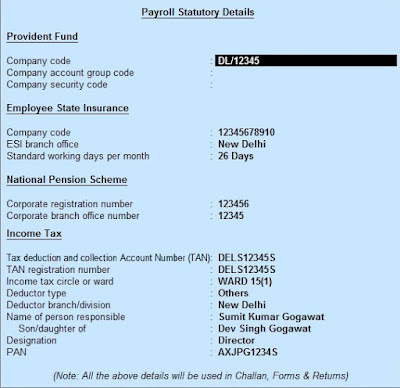 Enabling payroll in Tally.ERP9 gives you lots of features. In this, Payroll Statutory Features is one of the most important to maintain payroll. Enabling Statutory Details gives you to generate Provident Fund Return, ESI Return, Deduction in Provident Fund, PF Admin Charges and much more. So in this tutorial we know about how to Enter Payroll Statutory Details in Tally.ERP9. To use the provident fund, Employee State Insurance (ESI), National Pension Scheme (NPS), Income Tax and Professional Tax for Indian payroll. Set Enable Payroll Statutory to Yes. 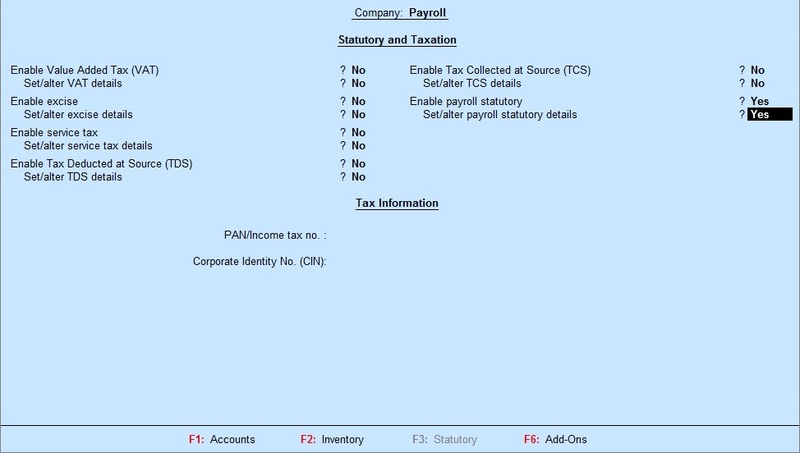 Enable the Option Set/ Alter Payroll Statutory Details. Enter Standard Days of Work (per month), enter the number of days considered for calculated daily basis wages and monthly gross amount for ESI Benefits. Specify your 10 Digit TAN No. assigned to the employer. Enter the Ward / Circle as per your income tax records. Select the type of Deductor - Government for central / State government Companies and Others for any other company, firm, individuals. Enter the name of Responsible Person or Authorised Signatory who signed all the statutory reports. Enter Father's name of Responsible person or authorised signatory. Press Enter to accept and Save. Now you are ready to access PF Return, ESI Return, NPS Return, TDS return etc.